focus on rhinoplasty, eyelid, and facelift surgery. As a face specialist, she understands the intricate anatomy of the face and the aging process. By focusing exclusively on the face, Dr. Harirchian believes that she can give her patients the best care and outcomes. She believes in an individualized tailored approach to facial aesthetic and reconstructive surgery. Each patient and face is unique, and care is customized according to patient’s desires, expectations, and individual features. She combines her artistic eye, perfectionist style, and understanding of the science behind the aging process. As a result, Dr. Harirchian provides the most cutting edge, natural and maximal results with the minimal downtime and recovery time. She believes in a minimally invasive maximally effective approach to facial rejuvenation. She accomplishes this by integrating innovative treatments with time proven techniques. Dr. Harirchian is committed to highlighting your individual beauty, and restoring the most natural, refreshed, and revitalized version of yourself. Dr. Sanaz Harirchian graduated with a Bachelors degree in Biology from Brown University. She obtained her medical degree (MD) from the New York University School of Medicine. She completed a 5 year residency in Head & Neck Surgery at Rutgers. She then completed a prestigious and highly coveted fellowship in Facial Plastic & Reconstructive Surgery at the University of Miami. This is one of the most sought-out fellowship programs, under the auspices of the American Academy of Facial Plastic & Reconstructive Surgery. During her fellowship, she acquired advanced and cutting edge techniques for facial cosmetic and reconstructive surgery, and benefited from the knowledge and expertise of many world reknowned leaders in the field of facial plastic surgery. She now brings her love for her patients and her commitment to plastic surgery to Houston. Dr. Harirchian is board certified by the American Board of Otolaryngology Head & Neck Surgery and fellowship trained in Facial Plastic & Reconstructive Surgery. In addition to her skills in plastic surgery, Dr. Harirchian is an avid author, educator and researcher. She has authored numerous journal articles and book chapters. 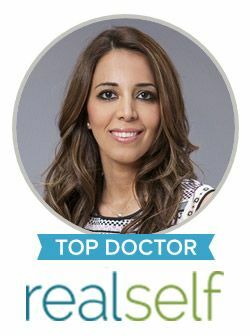 She is consistently learning and contributing to the field of facial plastic surgery, to be able to provide the most advanced and proven techniques to her patients. She is committed to consistently providing the most compassionate, dedicated, and luxurious care for the best results. Contact our office today to schedule a consultation with Dr. Harirchian.